This resource was designed to enhance your Math Workshop and increase student engagement for April/Spring. 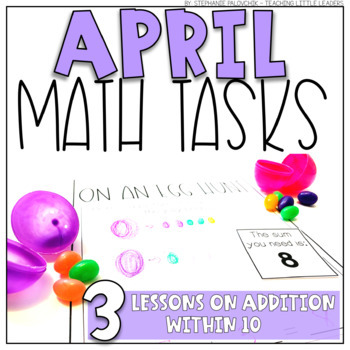 It includes 3 task-based lessons for your Math Workshop that focus on number combinations within 10. Use it for whole group lessons, small group lessons, or even in centers. Click the Green Preview button for a closer look at what's included. During each lesson, students will work as a class to answer a math question. During the task part of the lesson, students will work individually, in pairs, or in small groups to apply the same problem and record their thinking. Lesson 1 - Going On An Egg Hunt: Students are go on an egg hunt for jelly beans. They get a plastic egg with a given number of jelly beans to start. They are also given a sum that they are looking to get to. They count the jelly beans they are starting with and search around the room for another egg that has enough jelly beans to reach their sum. They'll use either the jelly bean printables that are included, actual jelly beans, or your choice of math tools, and represent their work on a recording sheet with pictures and/or numbers. Lesson 2 - Carrot Gardeners: Students become gardeners! They get a "garden" with a given number of carrots to start. They are also given a sum that they are looking to get to. They count the carrots they are starting with and search around the room for another garden that has enough carrots to reach their sum. They'll use either the carrot printables that are included, or your choice of math tools, and represent their work on a recording sheet with pictures and/or numbers. Lesson 3 - Let's Recycle: Students "work" at a "recycling plant". They are given 2 recycling bins that contain different recycled materials in them. They have to add the materials from each bin together to find the sum. Then, they organize it on a recording sheet to prove the sum they have. Don't forget to check out the PREVIEW by clicking the green button underneath the cover where you can see pictures of what's included. **EARN CREDITS TO SHOP: Leave feedback after purchasing to earn points on TPT that you can apply to future purchases :) Each dollar spent is 1 point. 20 points = $1 credit!